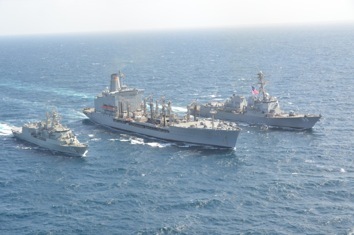 Coalition war ships conducted Combined Exercises at Sea on 6 Feb 13 in line with the Combined Maritime Forces (CMF) motto of “Ready Together”. Combined Task Force 151 (CTF) units USS Farragut, HMAS Toowoomba and CTF-53 unit USS Walter S Diehl participated in the exercises which commenced in the morning and continued till late afternoon. Commodore M Hisham of Pakistan Navy (CCTF-151) also visited HMAS Toowoomba from his Flag Ship USS Farragut CCTF-151 and Commanding Officer HMAS Toowoomba, Cdr Brendon Zilko, discussed matters related to piracy and preparedness for conducting Counter Piracy Operations. During the visit Cdre Hisham onboard Toowoomba witnessed the ships boarding-team conducting a weapon firing demonstration and other exercises including High Speed Manoeuvres. He was pleased to see the professional competency and readiness of the participating units. Later he was given a tour of the ship and was also briefed on the Counter Piracy capabilities of Toowoomba. Later in the afternoon after the transferring back of all the personnel, the ships proceeded to their respective deployment areas.